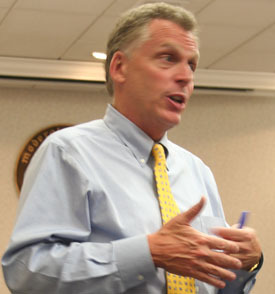 Presumptive Democratic Party gubernatorial nominee Terry McAuliffe announced Wednesday that Ellen Qualls and Alan Moore are joining his campaign. Qualls will serve as senior advisor, and Alan Moore will serve as direct mail consultant. Ellen Qualls is an experienced Virginia political strategist who has worked at the state and federal level. For five years, Ellen served as a senior communications advisor to Virginia Governor Mark Warner. Previously she was a television, radio and print reporter in Virginia and served as the President of the Virginia Capitol Correspondents Association. Most recently, Ellen served as the Director of Surrogate Communications for the 2012 Obama Campaign and was a Senior Advisor in Speaker Pelosi’s office. Alan Moore has worked on Virginia campaigns at the state and federal level for over a decade. In 2012, Alan was his firm’s lead for the Obama Campaign’s mail in Virginia; and he created the direct mail for Senator Tim Kaine. Alan also created mail for Senator Warner’s 2008 Coordinated Campaign and for former Congressmen Glenn Nye and Tom Perriello. He served as Executive Director of the Democratic Party of Virginia in 2001 and has led two statewide coordinated campaigns: Governor Kaine’s in 2005; and the 2007 legislative Coordinated Campaign which helped Democrats retake the Majority in the State Senate.